On Tuesday, the Denver Broncos attended Notre Dame's pro day, which was highlighted by the presence of middle linebacker Manti Te'o. After running a 4.82 40-yard dash at the NFL Scouting Combine last month, Te'o improved his time to 4.75 at his pro day. 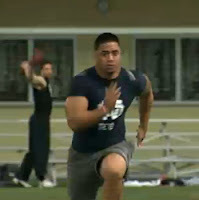 "The Broncos offer the perfect scheme fit for Te’o," wrote McShay. "He plays fast enough to get from sideline to sideline, and he could be a very good player with Denver’s defensive linemen protecting him. And with Peyton Manning leading the way, the Broncos have the leadership in place to deal with any concerns about Te’o fitting into the locker room." Popular opinion on Te'o has been generally negative after a hoax involving Te'o and a fake girlfriend was followed up by his poor performance in Notre Dame's 42-14 loss to Alabama in the National Championship. But the Broncos seem to remain interested. According to the Denver Post's Mike Klis, the Broncos will draft a cornerback, running back and defensive lineman in the first three rounds this April, possibly in that order. As usual, it's hard to tell if Klis is pulling something out of the air or if he received information from the team. If the latter is the case, the team may have been bluffing. But CB, RB, and DL do appear to be some of the top positions of need on the roster. Adding MLB to the list is not out of the question. My mock has the team drafting Alabama running back Eddie Lacy 28th overall (Denver's first round selection). If Lacy doesn't fall that far, I see Te'o as the second-best option. The Broncos do not have a proven MLB on the roster—Te'o could fill that role. In his senior year, Te'o totaled 113 tackles, 5.5 tackles for losses, 1.5 sacks and recorded 7 interceptions. The first round of 2013 NFL Draft will take place on Thursday, April 25 and will run through Saturday, April 27 on NFL Network and ESPN. The Broncos own six selections (28th, 58th, 90th, 125th, 161st, 234th), with a pick in all but the sixth round.